In the County of Dedu in the northern part of Heilongjiang Province which one reaches after crossing the lush grass-lands on the Nenjiang River plain and a range of rolling green hills, one can see even from afar the spectacular sight of fourteen interlocking conic landforms towering over boundless stretches of fertile farmland. In the midst of these conic volcanoes which are situated southwest of the Lesser Xing'an Mountain Range are a series of five sparkling lakes looking like a chain of gems set in their midst. This is the famous scenic spot known in Chinese as Wu'Da'Lian'Chi or the Five Big Connecting Lakes which is included among the major scenic resorts of the country. To the southeast of Mo'Er'Gen (No e:Nenjiang River today.) fire suddenly burst out from the earth one day spewing rocks and debris and creating a noise that was heard for miles around. In the summer of 1720, fire and ashes suddenly erupted with a thundering noise that lasted for days on end and could be heard scores of miles away. It is assumed that the continual eruptions lasted over a period of two years during which the Old Black Hill and the Burning Hill finally took form. The lava pouring out during the eruptions finally cut up the nearby Xiao'Bai'He or Lesser White Rivet into five segments, forming thus five barrier lakes of different sizes that look from the air like a row of crystal plates. The water in the lakes, a slight tan in colour is lucidly clear, with the sand and pebbles at the bottom clearly visible. The five lakes, which flow into each other, stretch along a total distance of 20 km and cover some 40 sq km. In their deepest parts, the lakes are more than 100 metres in depth. The scenery surrounding them has a beauty all its own, looking like a Chinese landscape painting of mountains, waters and rocks, as the quaintly shaped lakes are encircled by 14 conic hills and lie interspersed with stretches of congealed lava. What are named the First Lake and the Secong Lake have sinuous shorelines and are surrounded by rugged lava flows. As in some places the lava flows had forced their way into these lakes there have been formed many tiny islets, protrusions, water pools and coves. The water in the lakes limpid, the rocks scattered about picturesque, it is indeed a garden of nature of great beauty. 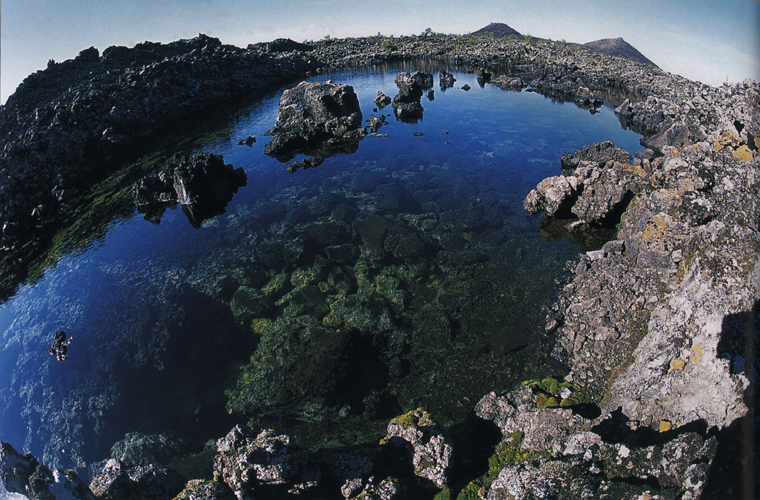 In the midst of the solidified lava flow on the west shore is a water pool where the water does not freeze in winter. Known as the Warm Pool, it remains at a constant 14Ã¯Â¿Â½Ã¯Â¿Â½ even in the depth of the winter, with misty steam rising from the surface while all around the tress are coated with ice crystal. This peculiarly attractive sight has been given the name Mists over the Warm Pool. Of the five linking lakes, the Third Lake is the largest and most picturesque, deep and teeming with aquatic life. There are more than 30 varieties of fish in the lake, such as carp, crucian carp, silver carp, catfish, etc. Rowing in the lake early in the morning of late in the afternoon, one can enjoy the beautiful surrounding scenery and its reflection in the shimmering limpid lake. Of the 14 conic volcanoes, the highest and most majestic is Nangelaqiu Hill. After tens of thousands of years of weathering and erosion, it is now a wooded hill where the weeds come up to the knee. One may see an occasional outcropping or two on the hill, but mostly it is covered by a thick layer of fallen leaves and twigs so that when treading on it one feels as though reading on a super soft carpet. The crater is a cauldron-shaped depression in the centre of which is a spread of water grown thick with artemisia and mugwort as in a swamp. Of the 14 conic hills, the one with the lowest elevation is named Yaoquan Shan or Medicinal Spring Hill which has now been turned into a good health resort. Scattered about on the hill are a number of mineral water springs such as the Nayin Spring, the Beiyin Spring, the Fanhua Spring, thee Xiyan Spring, ect. from all of which water keeps gushing out all the year round. 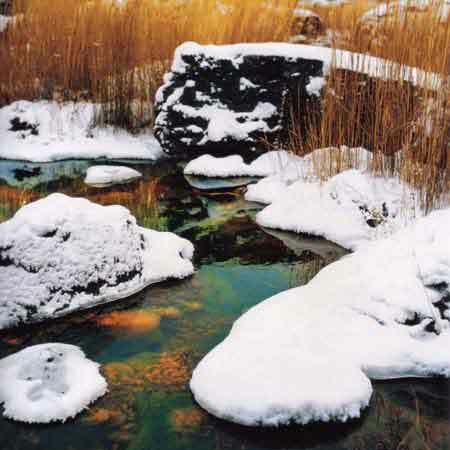 The low mineral-salt and richly carbonated water in the these springs is rich iin trace elements and has good therapeutic value. Although slightly pungent, the spring water is pleasant to the taste, fizzing like aerated water. It is believed that the water has such effects as helping digestion, stopping pain, tranquillizing nerves, inducing sleep and increasing the secretion and flow of urine, and it is particularly good for those suffering from diseases of the digestive system such as stomach ulcer and gastritis. The Fanhua Spring is where people take therapeutic baths in richly carbonated water for skin diseases in general and psoriasis and scalp fauve in particular. The water of Xiyan Spring is particularly good for brewing liquor. Story has it that long long ago a young man of the Daur tribe was wounded all over the body. He came to take baths in the spring here and wounds quickly healed. So as not to forget where the spring was located, ht inscribed on a rock by the side of the spring the two characters of Yao and Quan which mean Medicinal Spring. According to the local people, what the young man named Yao'Quan is actually Nanyin Spring today. Another story has to do with a deer that was wounded in the leg. With hunters in hot pursuit, the deer came to Nanyin Spring. After drinking a few mouthfuls of the water there, the deer seemed to have regained its vigour. Wading across the spring, it then fled speedily away, its wounds apparently healed in the course of the wading. Consequently, the springs here became famous far and wide and drew large numbers of Daur herdsmen to the spot. They set up tents nearby, bathing in the springs and drinking the water. This has developed into what is now known as the Water Drinking Day that falls on the fifth day of the fifth lunar month. On that day, the local residents will gather near the springs and celebrate the day by bathing in and drinking the spring water. Today Yaoquan Hill has become the biggest health resort in China featuring carbonated water baths. 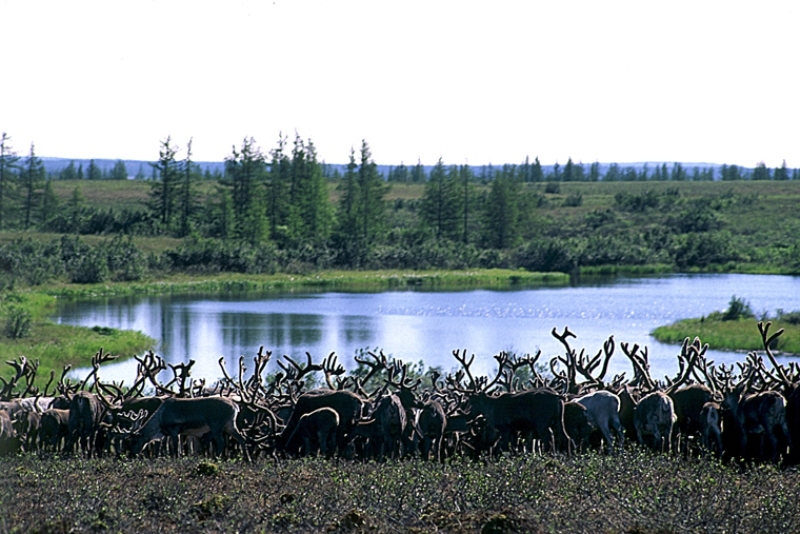 The busiest season is late spring and early summer when people flock here for rest and rehabilitation as at this time the water is most highly ionized. Of the conic volcanoes, looking majestic as well as mysterious, the older ones are now almost completely covered with plant life and so have lost the typical geomorphologic features of volcanoes. But the Old Black Hill and the Buring Hill that erupted less than 300 years ago, round about 1720,are the youngest volcanoes in China. As they have retained the geomorphologic features of volcanoes in full, they have the reputation of being museums of volcanic geomorphology. Pouring out of the orifices of these two volcanoes, the lava flowed in a generally southerly direction, spreading over an area of more than 60 sq km before petering out. The solidified lava at the foot of these hills now looks like a billowy sea, boundless, having engulfed everything in its path, so willful that no one can say for sure which way it had wanted to go. On the fringes are strewn colossal black volcanic boulders that form a rambling line extending scores of kilometres long, looking like the sinuous body of a swimming dragon or a long winding dyke. Technically called a lava platform, it offers one of the most spectacular sights at the Five Big Connecting Lakes. Everywhere on the platform is evidence of how the furious molten lava had once raged, surged, and whirled. Looking unimaginably wild and rugged, it is like a raging sea instantaneously and abruptly congealed, conveying a vivid, awe-inspiring picture of the original eruption with its pouring lava and calling up in the mind's eye stupendous scenes of raging flames and ash. On the lava platform are stretches of what are known as lava flats that are extremely level. The larger ones are of the size of city squares while the narrower ones are like stretches of asphalt roads. These were formed when the lava flow moved sluggishly. But the solidified lava also assumes other forms such as huge buns or wave crests which were formed when the lava flow moved fast. When somewhere in its course the flow was impeded, various distorted forms resulted, such as coiled boas, rope knots, whirlpools, elephant trunks, reptiles, buns, mushrooms and what not, all very life like, breeding fancies in the viewer's mind. On the lava platform are also seen now and then considerable fissures which where caused by the abrupt cooling of the lava. On the lava platform are also pagoda-like lava formations. Standing a couple of metres high, these were formed when layer upon layer of lava spiraled up one on top of the other. Technically known as lava spines and popularly as air hammers, they exist in clusters and are considered the most precious relics of the eruption of a volcano. Thicker at the top than at the base, each spine has an air hole in the centre. If one stamps on the congealed lava nearby, one will hear hollow thumps coming up from underground, as there is a huge cavity underneath caused by the crusting of the surface of the lava flow while it was still moving in molten form underneath. It is most probable that under the platform there is a lava tunnel extending just as long, that is, for tens of miles! At the Five Big Connecting Lakes is on display a fascinating array of the geomorphologic features of volcanoes. If we can say that such picturesque sights as the Sever Star Crags and the Reed Pipe Crag of Guilin are evidence of the slow, unhurried work of nature in creating bit by bit its amazing wonders, here at the Five Big Connecting Lakes nature has dashed off with a few brilliant strokes a masterpiece, using the earth as a mere sheet of paper and magma as ink. As a scenic spot with an array of volcanic cones and a chain of crystal clear lakes and as a health resort with mineral water springs of good therapeutic value, the Five Big Connecting Lakes have become a unique tourist attraction in China.